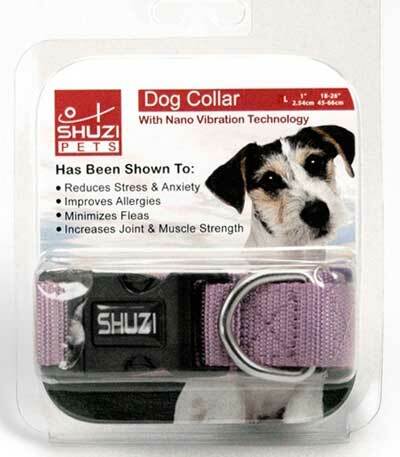 Dog collar is embedded with the Shuzi chip, which strengthens your pet's biofield, increasing his resistance to the effects of stress, including EMFs. Shuzi’s patented system uses Nano Vibration Technology (NVT), the use of subtle vibrational frequencies programmed at the nano (molecular) level. These frequencies resonate with your pet's own vibrations. Collar is made of black or purple nylon with clasp and tag ring. Available in two sizes: Medium: 5/8” wide, adjustable from 14 to 20 inches; and Large, 1 inch wide and adjustable from 18 to 26 inches. Black or purple.